Cook the whole wheat pasta about 1 minute less than the package directions, so pasta is done but al dente. Drain and reserve ¼ cup of the pasta water. In a large sauté pan, heat the olive oil over medium heat. When hot, add the minced garlic and reduce heat to medium-low. Cook for about 5 minutes until oil becomes fragrant. Be sure to watch the garlic so it doesn’t burn. Add the tomatoes and season with kosher salt and freshly cracked black pepper. Cook for 2-3 minutes until warmed through. 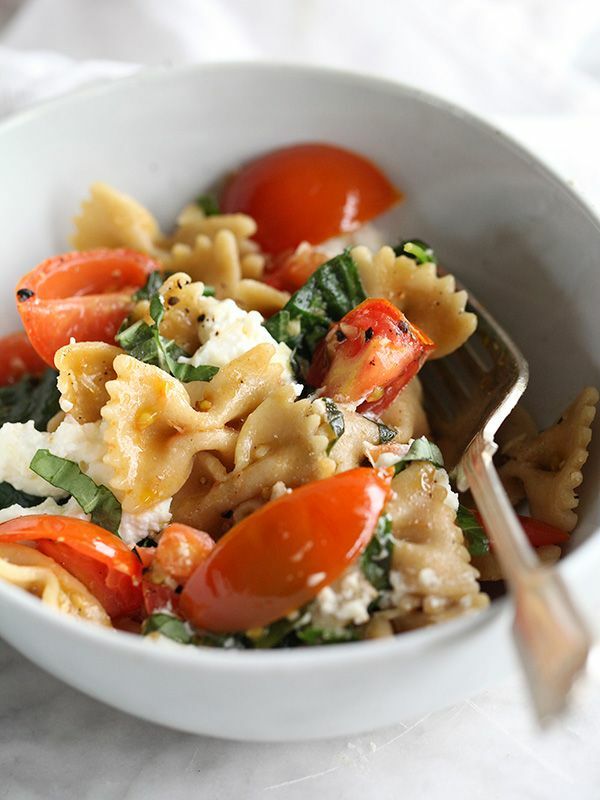 Add the drained hot pasta to the tomatoes with the fresh spinach. Toss and cook until spinach begins to wilt. Add the fresh basil leaves, grated parmesan cheese and more kosher salt and pepper to taste. If the pasta seems dry, add more olive oil or 1-2 tablespoons of pasta water to the pasta mixture. Top with dollops of fresh ricotta, drizzle with more olive oil and serve.